Redevelop vacant and damaged property into high-quality commercial space. 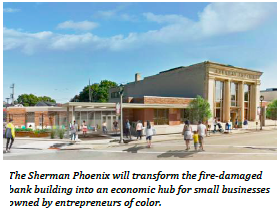 The project will redevelop the fire-damaged BMO Harris Bank building located near the intersection of Fond du Lac Avenue and 35th Street into an economic hub for 20 small businesses owned by entrepreneurs of color, who offer prepared foods, wellness services, and arts & cultural activities. 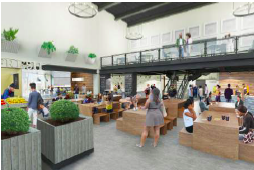 It will also hold a food hall with customer seating, an outdoor patio, and gathering spaces to foster community building. Strengthen entrepreneurs of color to help them grow their businesses, generate jobs and support the local economy. The Phoenix will offer business support through mentorship, business coaching, and networking. This support will strengthen the tenant businesses and improve sustainable growth. In turn, these businesses will create 75+ jobs, including entry and mid-level positions that provide training opportunities. Build community wealth and ownership through direct neighbor investment and an innovative co-developer model. 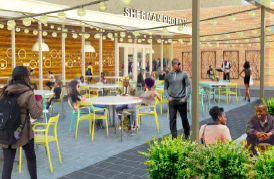 In addition to traditional financing, the project will attract neighborhood investors as a means of strengthening community ownership, wealth and support for tenant businesses. Additionally, the project uses a co-developer model that blends the strengths of a real estate developer with that of a community developer to build a model for community empowerment and transformation.